The Foo Fighters have cancelled a pair of shows on their current European tour following a leg fracture to frontman Dave Grohl after he fell off the stage in Gothenburg, Sweden on June 12. “As witnessed by tens of thousands in attendance at Foo Fighters’ June 12 show at Ullevi Stadium, Dave Grohl took a nasty spill during the second song of the set,” says the band. “With the help of on-site medical staff who patched him up temporarily, Dave was able to rejoin the band to complete that performance. 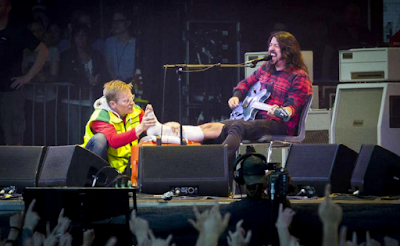 “While the full extent of Dave’s injuries are still being determined, it was confirmed at a post-show hospital visit that he sustained at least one fracture. The Foo Fighters next appearance is scheduled for London’s Wembley Stadium on June 19.